TweakPower - это интеллектуальный программный инструмент, который позволяет пользователям точно настраивать свои операционные системы и программы для оптимальной производительности. TweakPower защищает пользователей от проблем с ПК, одновременно повышая производительность и безопасность своего компьютера. TweakPower включает в себя расширенные оптимизаторы производительности. Теперь еще проще, чем когда-либо, получить чистый компьютер. TweakPower может быстро удалить мусорные файлы, программы и беспорядок в браузере, обновляя ваш реестр и очищая огромные дисковые пространства. 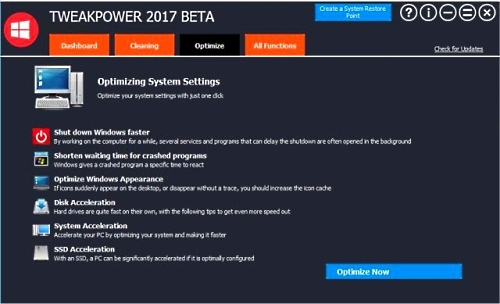 TweakPower is an all-in-one suite that has been designed to keep you and all your familys computers running at optimal speed and efficiency. 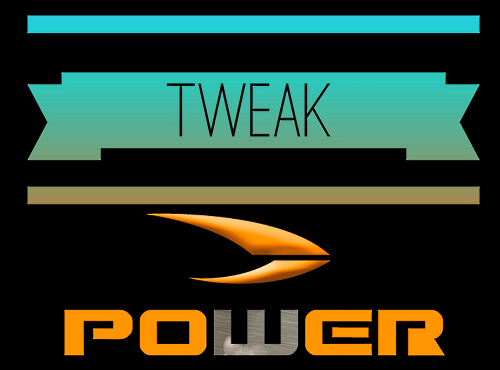 TweakPower is an intelligent software tool that allows users to fine-tune their operating systems and programs for optimum performance. TweakPower protects users from PC problems, while increasing the performance and security of their computer. TweakPower includes advanced performance optimizers, helping you achieve super-fast application load times, work faster and make your games run smoother. Now its easier than ever to get a clean PC. TweakPower can quickly remove Windows, program and browser clutter while refreshing your registry and deleting massive disk space hogs. Also, its easy-to-use wizards and diagnostic tools help you find vulnerabilities and errors on your computer. Clean up - keep your PC fit. Remove unnecessary files, clean up the registry, delete internet traces, and optimize your computer with just one click to ensure more stability. System Maintenance - Autostart programs, Autoplay, and Manage scheduled tasks, uninstall or change uninstaller programs, troubleshoot disk errors, and troubleshoot typical Windows problems. Customize Windows - Give Windows your own style. Customize the Windows interface by customizing the appearance of Windows, including colors, window frames, icons, buttons, startup and logon screen, startup menu, desktop display, explorer, and login. Communication - Customize Internet Explorer, Firefox and your connections to your needs and synchronize your computer with the atomic clock of a time server of your choice. Economy Mode - Significantly prolongs battery life by reducing the power consumption of the processor, switching off unnecessary background processes and reducing the power consumed by internal and external devices. Turbo Mode - One click turns off over 70 unnecessary processes, releasing power for faster browsing, gaming and videos. System Settings - Change the settings of the system, the input devices, drives, application programs, and effects to better customize Windows to your needs. Security - Protect your PC with the security features of Windows. Configure and manage the settings for the firewall, defrag, automatic updates, user account control, and security center. Permanently delete sensitive data from the hard drive, encrypt files using the highly advanced Advanced Encryption Standard (AES encryption), and safely delete the original files, control the settings of the display, printer, network, and protect your privacy 'AnitSpy'. Data backups - TweakPower saves all optimizations. All changes from TweakPower can be taken back here. Restore points enable you to restore the computer's system files and settings to an earlier state, and to perform a complete backup or restore of the registry. Other features - The file splitter allows you to split files of any size into multiple files, quickly and easily find out about the complete system settings and devices, browse the registry in Turbo mode, and get an overview of important system utilities.